Two second half quickfire goals see the Blues fall to a home defeat this evening against Play-Off side Dover. A header from Kevin Lokko and a Ryan Astles own goal ensured the Kent based visitors left the Swansway with all three points this evening. A quiet start to the game saw Dover have two half chances, but Ade Azeez and Ryan Bird fired wide of the mark. At the other end, Gary Roberts whipped a free kick just over the crossbar and Harry White was brilliantly denied from Jordan Archer’s flick on; as the game was goalless at the interval. Chester were hoping to build on an encouraging first 45, and the signs were good as Matty Waters was foiled by Mitch Walker – before Tom Crawford was also denied by the keeper via a deflection. White then fired just wide of the mark as the Blues momentum continued to build. But they were dealt a sucker punch on 64 minutes when an unmarked Lokko nodded home from Mitch Brundle’s corner. It was two just seven minutes later, as the pace of sub Anthony Jeffrey caused problems down the right and his cutback was guided into the net by the unfortunate Blues skipper Astles. 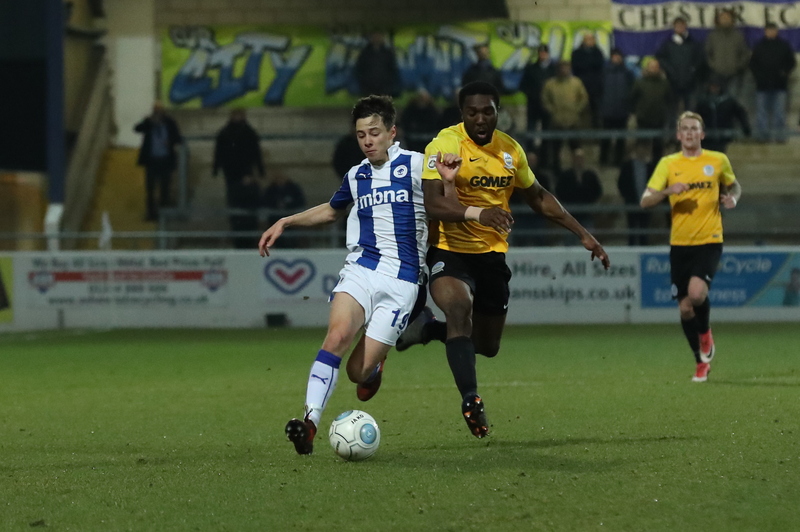 Chester struggled to conjure up any kind of response – sub Ross Hannah firing just wide from a free kick in stoppage time – but the visitors took home all three points. Chester: Firth, Halls (Mahon 82), Hobson, Astles, Anderson (Hannah 69), Waters, Crawford, Roberts, Vose, White, Archer. Subs not used: Jaaskelainen, Jones, Akintunde.